There are over 65 million dogs in American households, many of which make significant contributions to our lives. There are search and rescue dogs finding missing loved ones, bomb dogs, drug dogs, and police dogs protecting our communities, service and assistance dogs helping the physically challenged, therapy dogs comforting the sick and the elderly, and family pets who provide love and companionship. We see children with dogs everyday; at the neighbor's house, at the park, in cars, and on TV. Everyday we are reminded how crucial our program is to the well-being of a child. The For Kids' Sake Safety Around Dogs program was created to help protect children from injuries and/or fatalities that, in most cases, can be prevented. 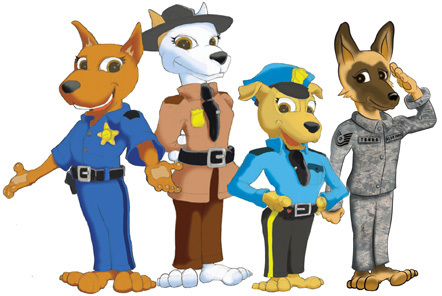 Our Safety Around Dogs program was designed by dog trainers/behaviorists, veterinarians, doctors, and educators who are dedicated to preventing children from being seriously injured, or even worse, killed in dog bite incidents. The good news is most dog bites and attacks can be prevented!